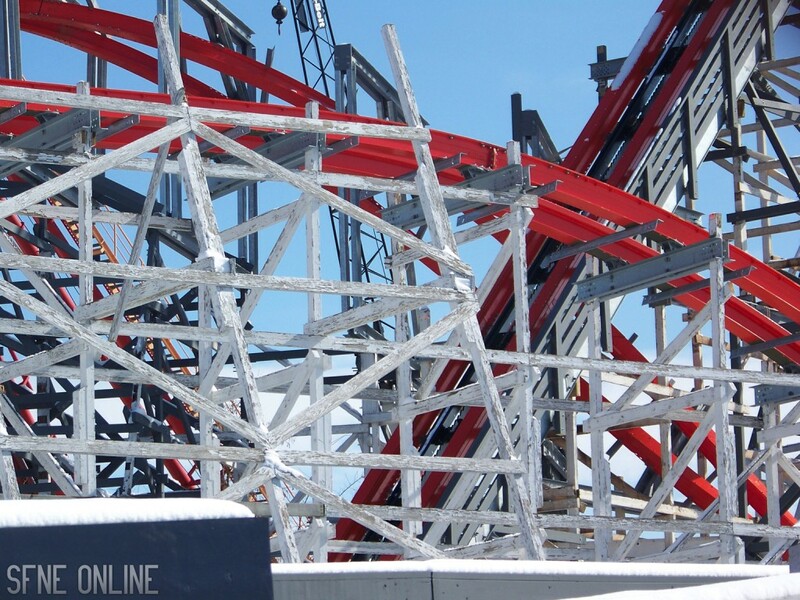 On first viewing, it won’t look like anything was done to Wicked Cyclone since our last update. And that’s pretty much true. There has been even more snow in the time between updates. 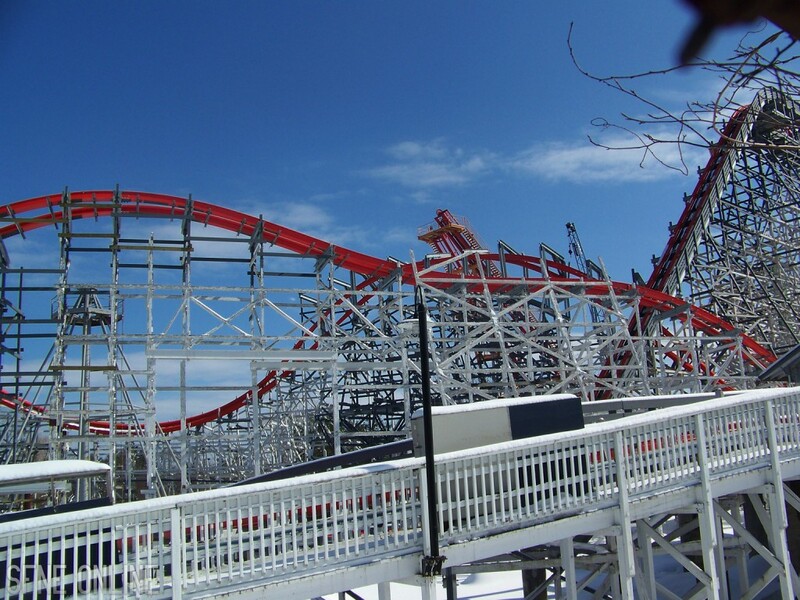 We’re assuming this weather has caused some delays with shipments of the track and trains. 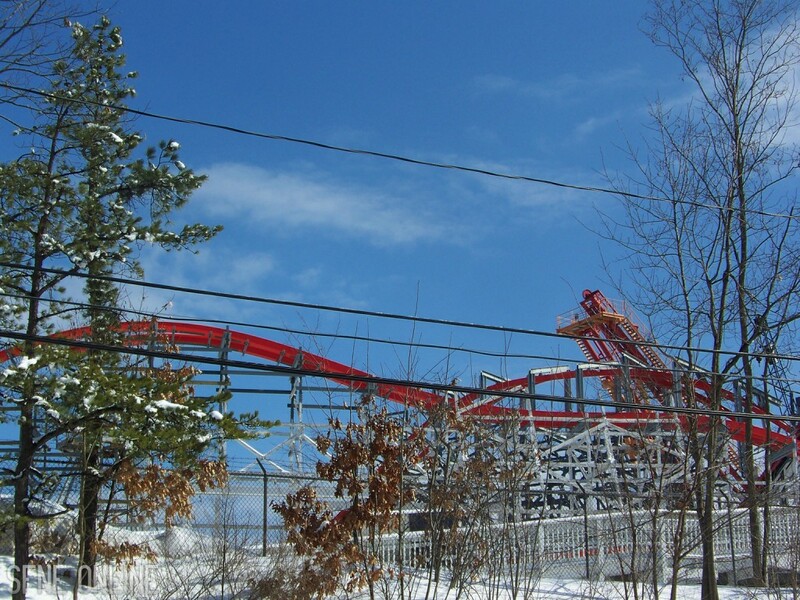 Even though heavy construction has appeared to stop, the RMC crews are still working diligently on getting Wicked Cyclone ready to open in the spring. 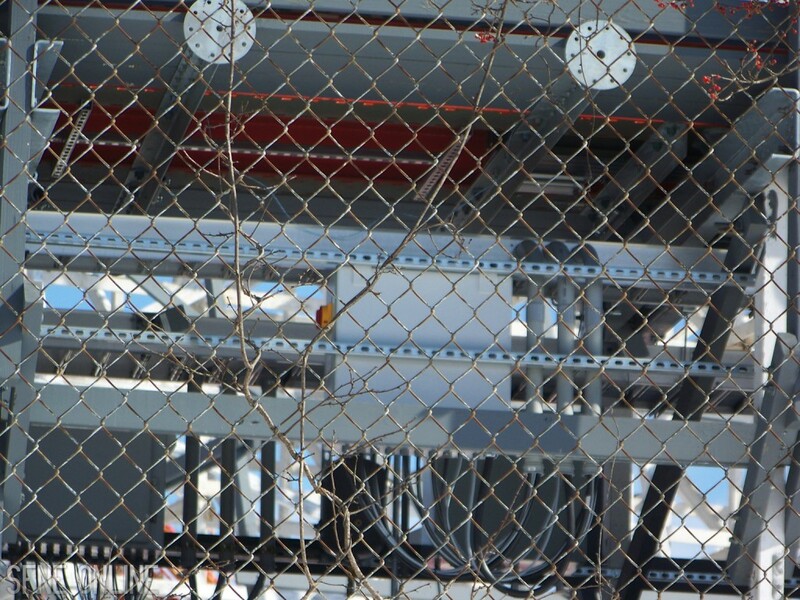 This is apparent by the enclosure of the station, which makes it easier for the crews to work on the inside. 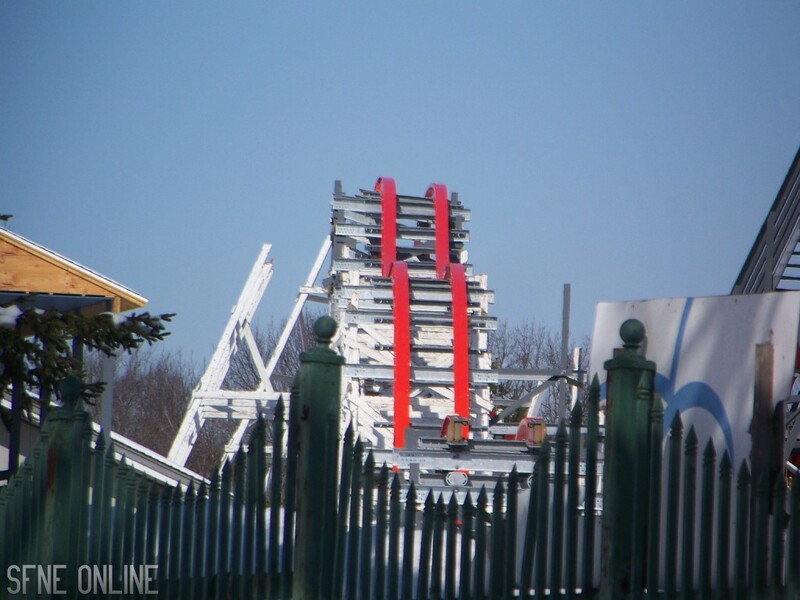 Work on the anti-rollbacks and chain lift guide has started. Actually, it looks like that work is already complete. 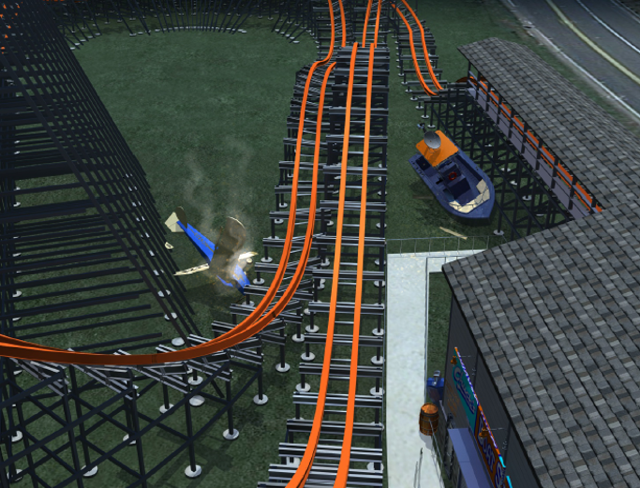 Also, if you look closely, you can see the return path for the chain. If you can’t make it out, it’s the thing that’s connected to the newly installed, unpainted pieces of wood. The gear wheel will be going here pretty soon. 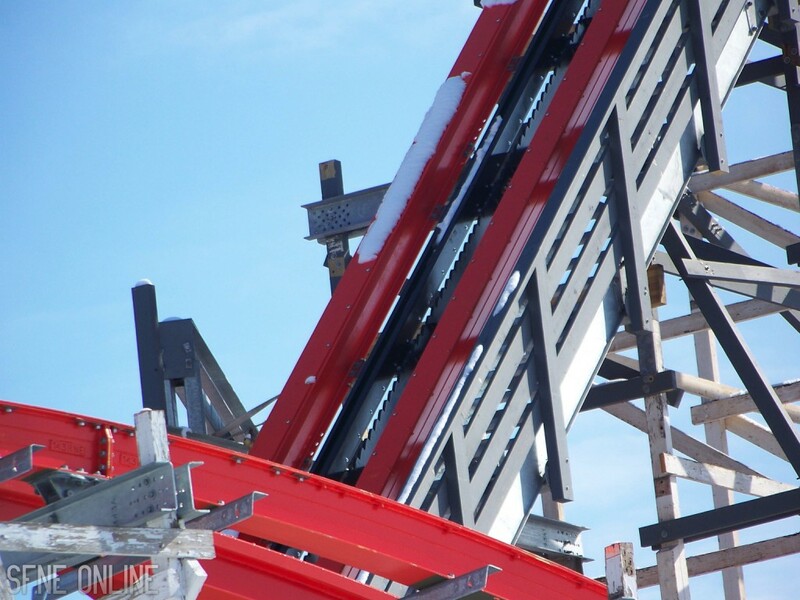 The gear wheel is what guides the chain back down to the bottom of the lift hill using the return path seen in the pictures above. 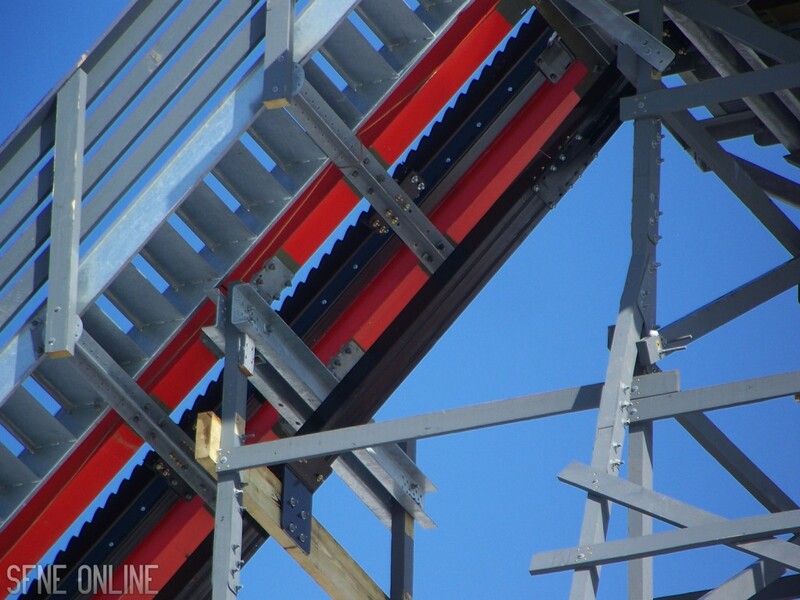 A different angle of the newly installed pieces of the lift hill. Here you can make out the guide pieces for the chain. 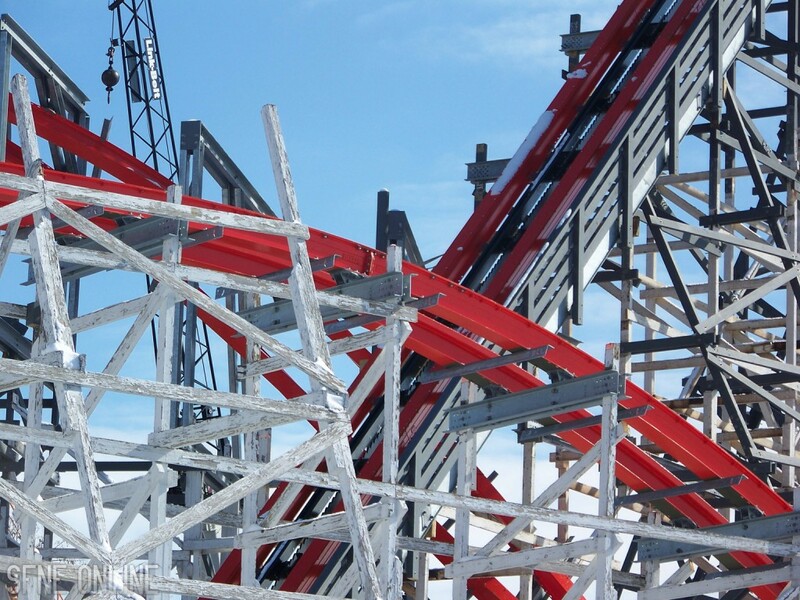 Really looking forward to this whole section of the coaster. 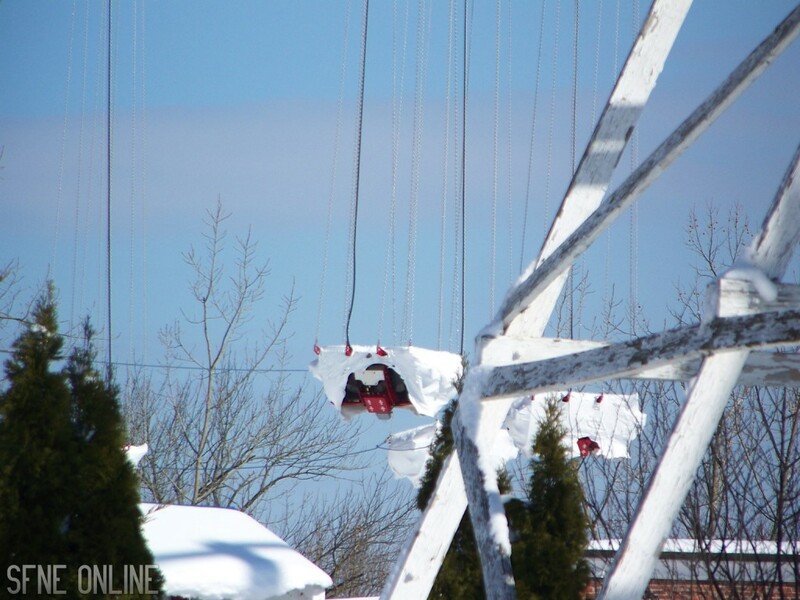 This gives you a good idea on how much snow New England has accumulated in the past month and a half. 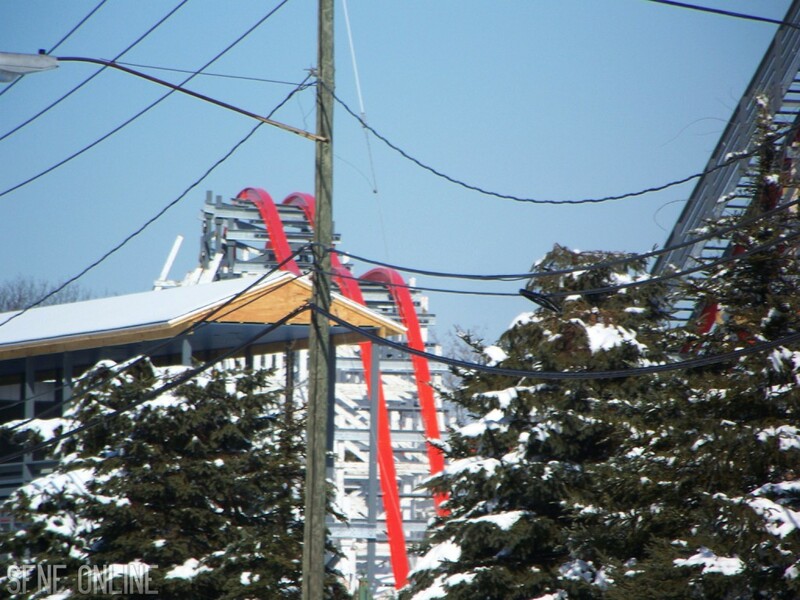 Here’s a different angle of the double down. 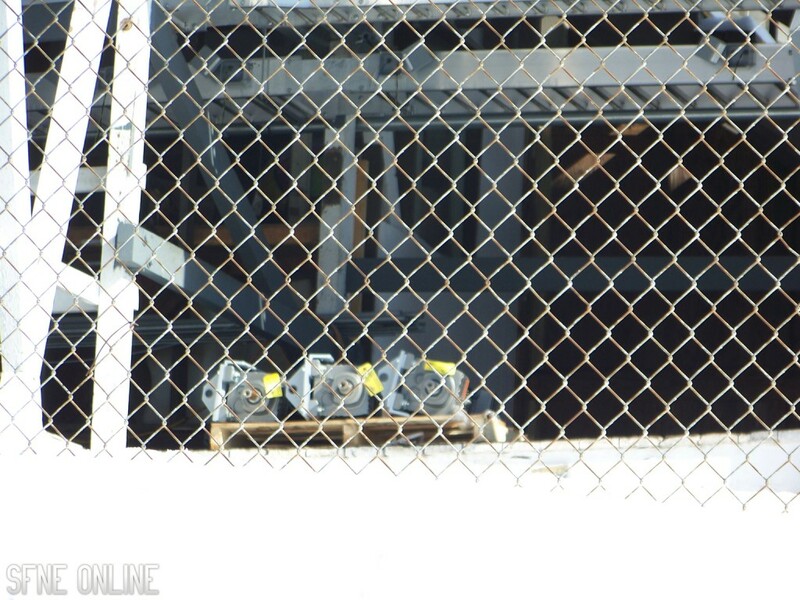 These look like drive motors for the brake run. 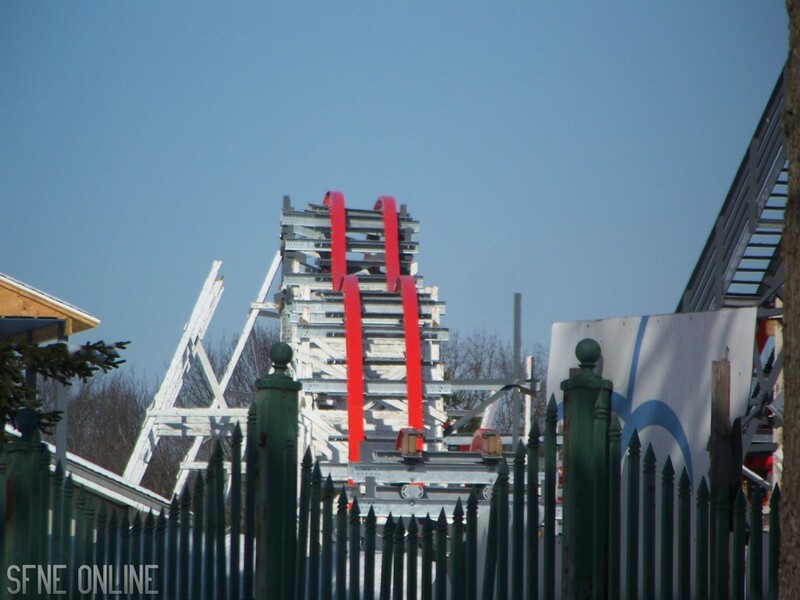 These will power the wheels that push the train back into the station. 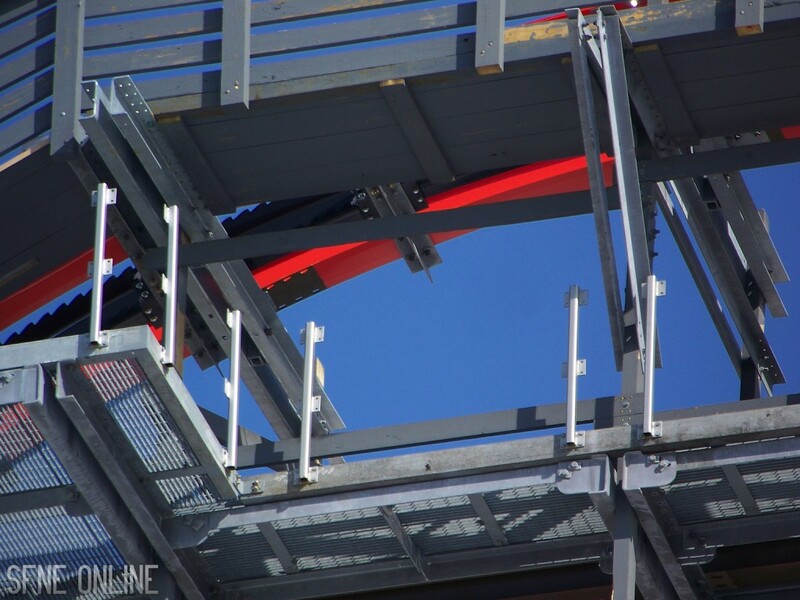 While we couldn’t get any pictures of it, we know the brakes are installed on the brake run from the pictures Rocky Mountain Construction recently posted to Facebook. 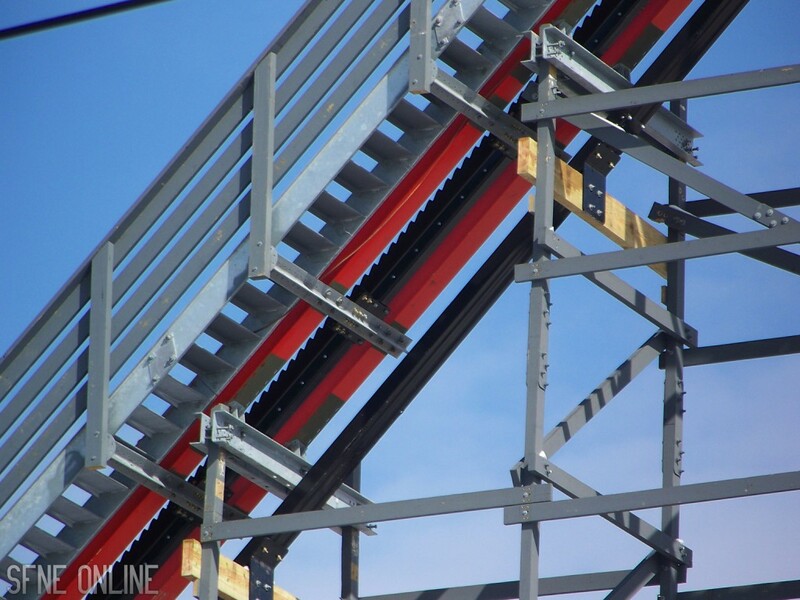 Random shot of the 120-degree over banked turn. 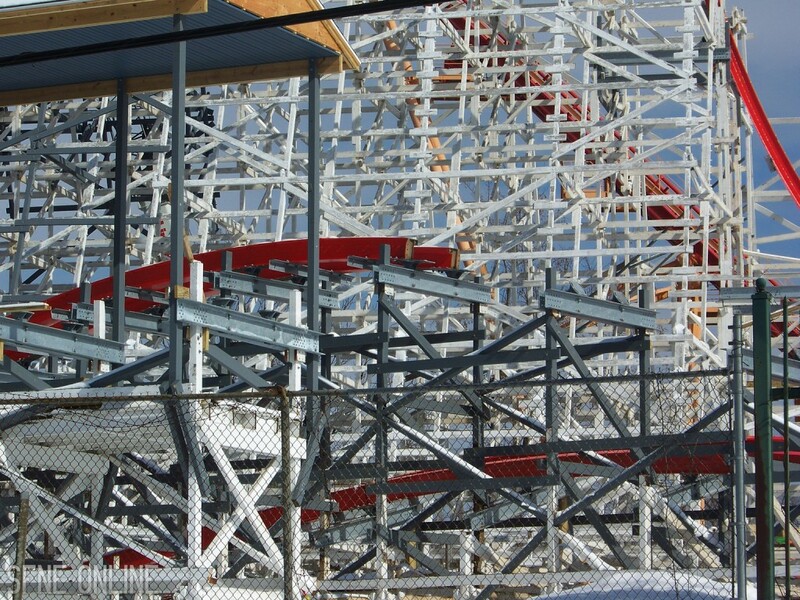 Final Wicked Cyclone construction picture. I’m really liking how photogenic the double down is. 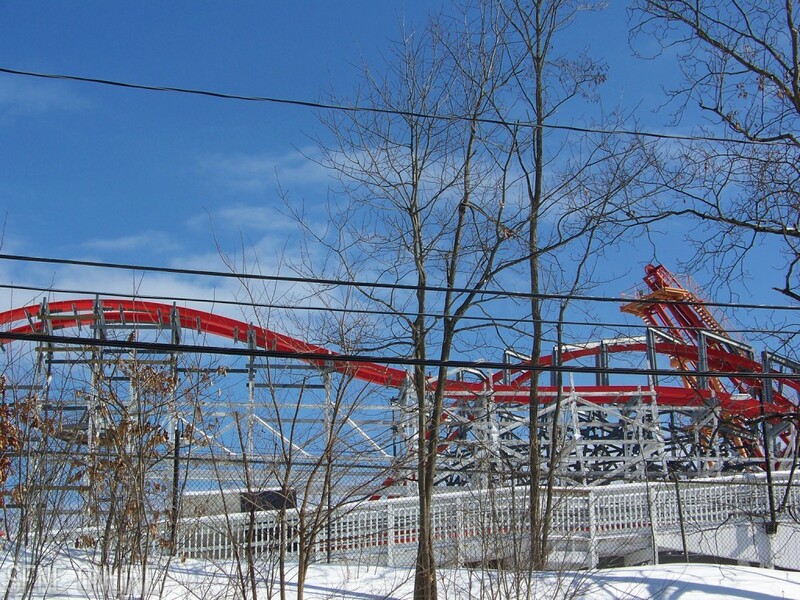 Here are some random pictures of New England SkyScreamer, just because. 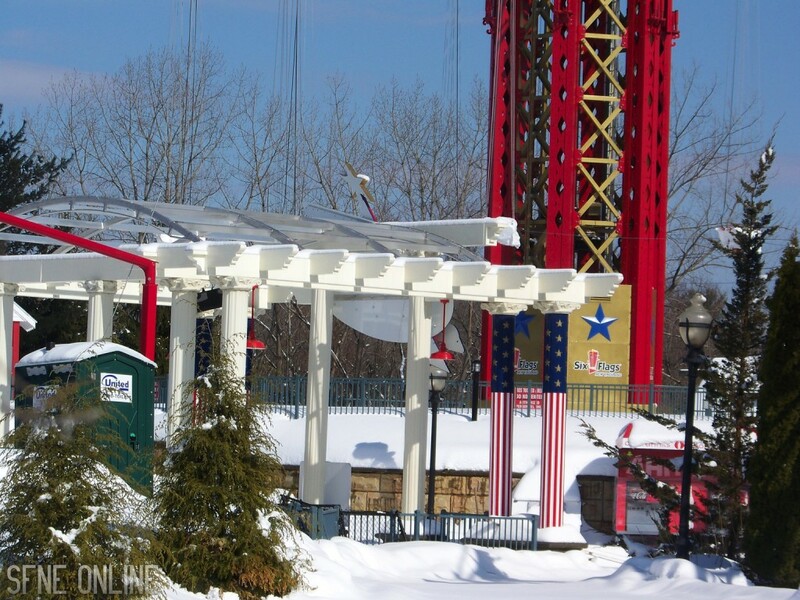 It’s pretty funny that Six Flags updated their logo this year, making the flags on the top of New England SkyScreamer outdated. It hasn’t even been a year! 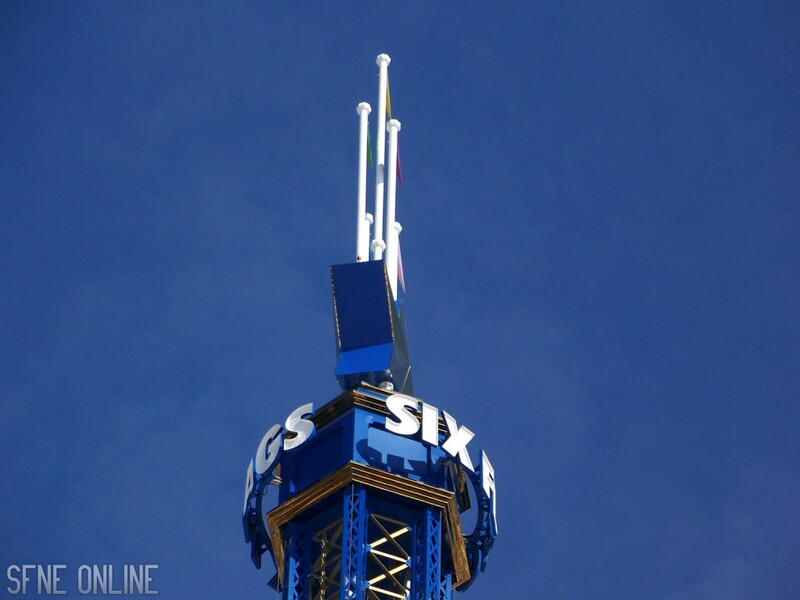 If you have no idea what I’m talking about, the Six Flags logo no longer has the pink flag for some reason. Now there are two blue flags for some reason. Why? Who knows. 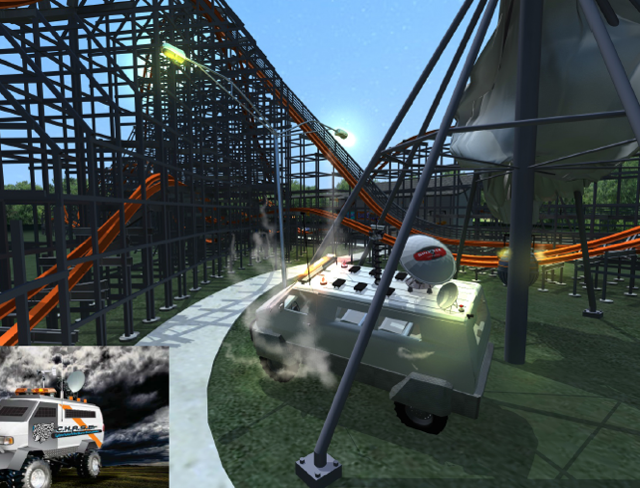 And finally… In our last update we showed off some of the Wicked Cyclone concept art. Well, this week we have a bit more to show off. 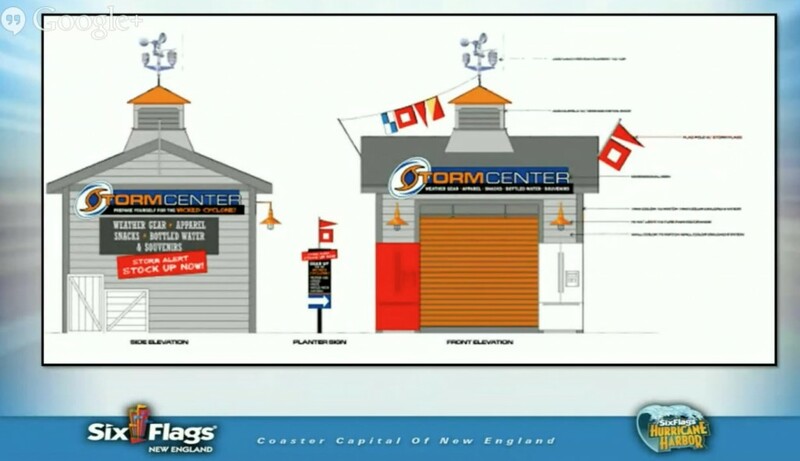 These were shown off to us during a live Google chat with Six Flags New England. You can rewatch the chat here. They decided to go even further with the storm chasing concept. 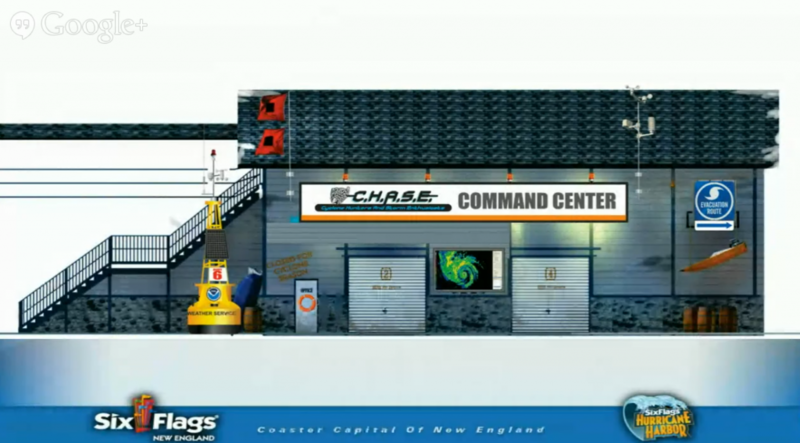 So now instead of the station being themed to Chuck’s Boat Service, it is now themed to the C.H.A.S.E. Command Center. What does C.H.A.S.E. mean? Cyclone Hunters and Storm Enthusiasts. All of the vehicles surrounding the ride will be themed to the storm chasing group. 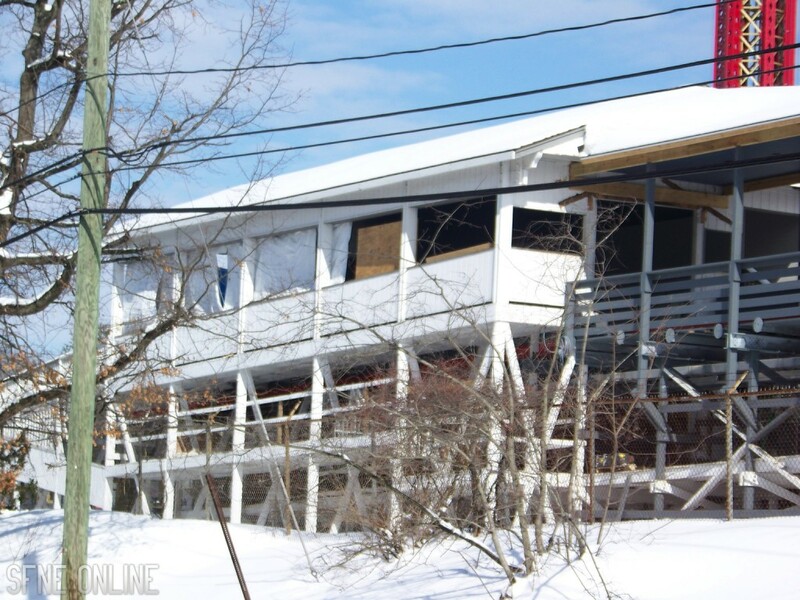 When the cyclone came by the Connecticut River, it picked up that boat and it landed here. 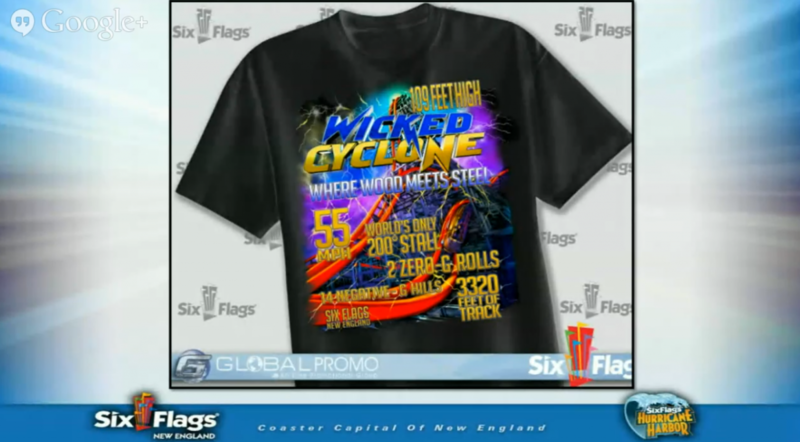 Keeping up with the storm chasing theme, here is a look at the retail store for Wicked Cyclone. It will be known as Storm Center. 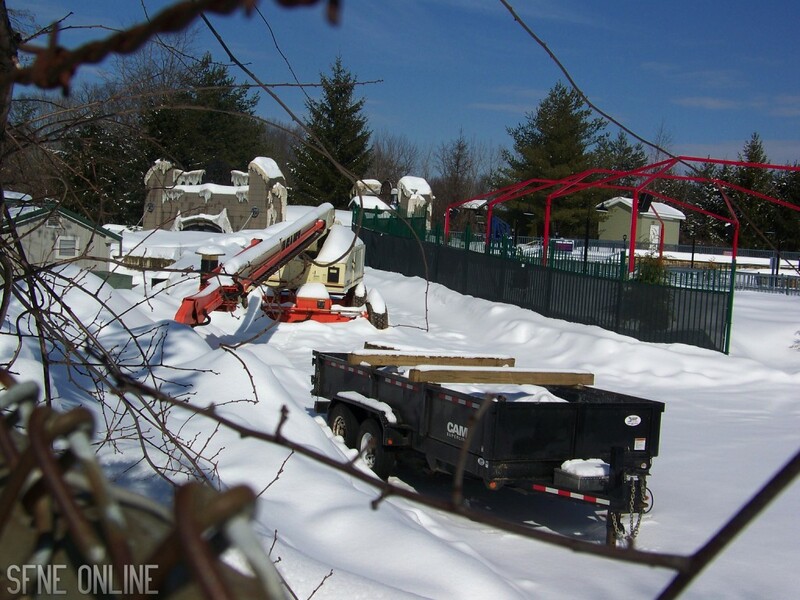 While SFNE didn’t reveal where this store will be, we’re thinking it will be along the exit of the ride. Looks pretty cool, doesn’t it? Lastly, here’s a shot of one of the shirts that can be bought at Storm Center. 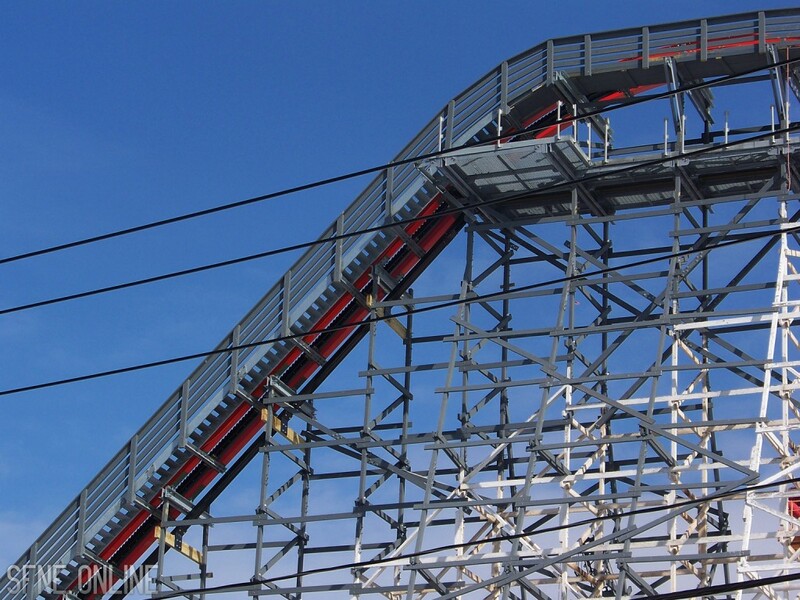 Personally, I’m not a fan of coaster facts shirt, but I know a lot of people are. 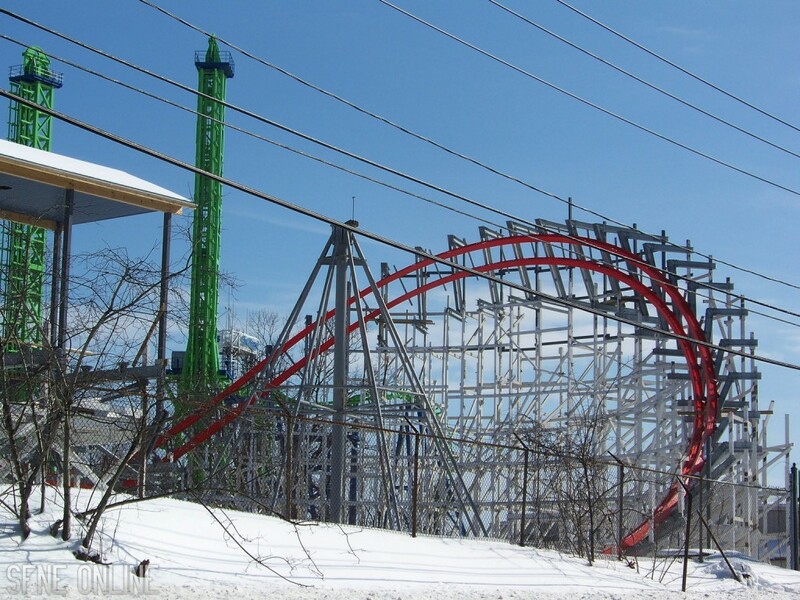 This concludes our twenty-first Wicked Cyclone construction update. Make sure you like us on Facebook, follow us on Twitter and follow us on Instagram. 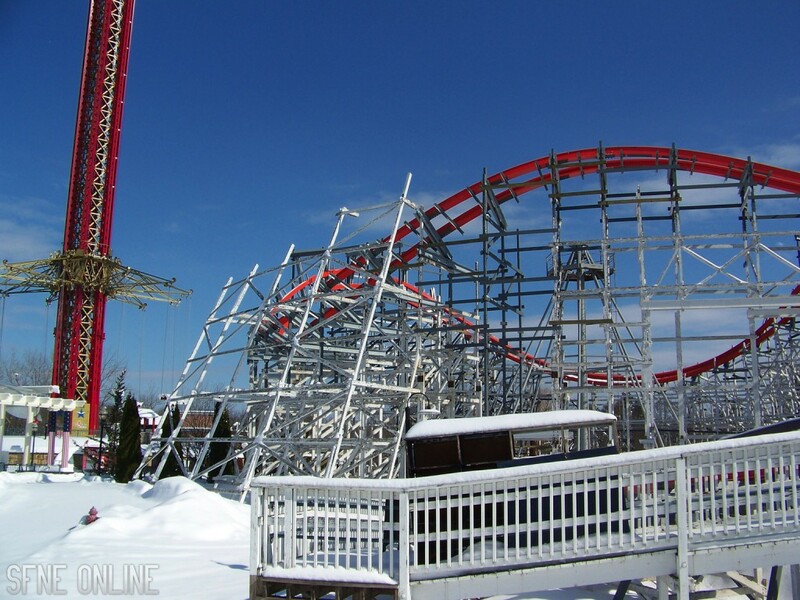 We post pictures of Wicked Cyclone in between updates, so you don’t want to miss out!